The New Orleans Estate Planning Council, now in its 54th year, is an association of estate planning professionals - lawyers, CPAs, life underwriters, bank trust officers, certified financial planners, and planned giving professionals. The Council provides educational and networking opportunities for professionals involved in the practice of estate planning. In 2008 we added a category of Associate Members for those practicing the same disciplines. 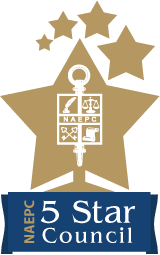 The New Orleans Estate Planning Council has been recognized as a 5 Star Council by the National Association of Estate Planners & Councils as a part of the Leonard H. Neiman and Walter Lee Davis, Jr. Council of Excellence Award program for the 4th consecutive year. This honor was created in 2015 to recognize estate planning councils that have demonstrated a high level of achievement in areas critical to a successful membership experience and was awarded to our council in 2015, 2016, 2017 and 2018. The Council of Excellence Award is named for two individuals who truly sought to strengthen the bond between NAEPC and its affiliated councils during their terms on the board. Walter Lee Davis, Jr. served as president of the association in 2008 and was instrumental in forming the Council Relations Committee, a group of volunteer members who are charged with being a liaison between affiliates and the national association. Leonard H. Neiman served the association as a board member for over fifteen years and worked tirelessly to gather information about estate planning councils from around the country. The council is a member of the National Association of Estate Planners & Councils, the leading professional organization for estate planners, which provides its 1,800 Accredited Estate Planner® designees, and 260 affiliated local estate planning councils and their 29,000 members with ongoing education and a forum for professional networking. For additional information contact: Administrator, Tara Knowles.